Two hundred years after Harwich was stuffed to the gunnels with soldiers waiting to go off to Waterloo it was strangely devoid of real ale lovers waiting for the Harwich and Dovercourt Bay Winter Ale Festival. 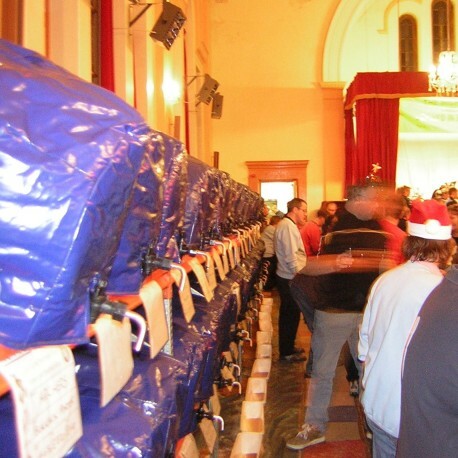 For it was in 2015 that the festival organisers at Tendring CAMRA were defeated by the lack of a venue after the Kingsway Hall, the festival's home for the previous thirteen years, became unavailable with less than three months to go. Fans of the festival will be relieved to know that the festival not only has a new home in 2016 it is also moving closer to sea level - assisting those who don't like walking up inclines or prefer their real ale served by gravity at a more sedate pace. Our new festival home is Parkeston Railway Club so travellers need to ensure that they disembark at Harwich International station and look out for our new name - Harwich & Parkeston Winter Ale Festival. Users of sophisticated electronic devices can key in CO12 4PQ whilst lovers of traditional mapping paper can look for TM 23779 32308. After that regulars will find things pretty much as we left them in 2014 - a friendly Winter Ale Festival with an eclectic assembly of fantastic real ale with the emphasis on dark and seasonal brews. We are also serious about real cider, with a carefully chosen list from around the UK, and our international beer bar has a fascinating selection of world beer. We have music on the Friday and Saturday evenings and, last but not least, a great selection of delicious hot and cold food. We hope that the festival works for you whether you are a seasoned ale-lover or a first-timer - we pride ourselves on our beer list and range of ales and being one of the smaller CAMRA festivals we offer a chance to explore a manageable selection of ales with knowledgeable staff on hand to help you make your selection. The festival runs from Wednesday 23th November (5pm to 11pm) to Saturday 26th November (11am to 11pm Thursday to Saturday) - we hope to see you there!